Bitcoin is a global form of digital currency. Unlike traditional currencies, which were frequently backed by gold and silver, bitcoin is based on distributed computing. 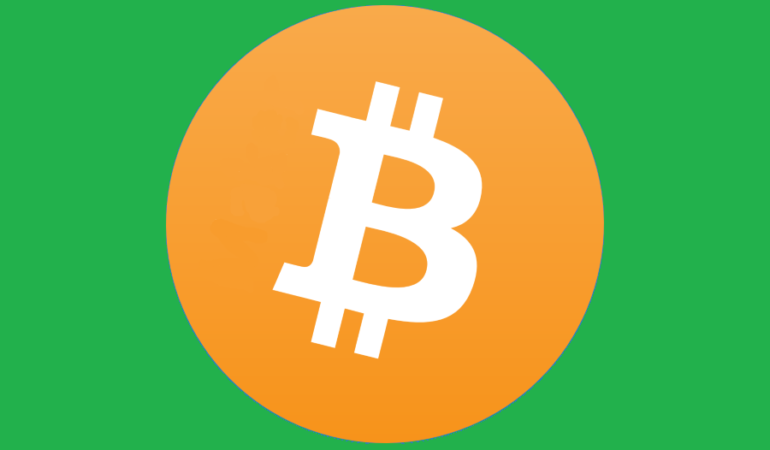 While traditional currencies are printed by central banks, bitcoins are created or “mined” by distributed computer networks. Bitcoin is the largest cryptocurrency and the most liquid when it comes to trading. It’s also quite volatile, which is ideal for trading. Long-term investors can buy the big dips, while short-term traders can trade intraday or a few times a week. 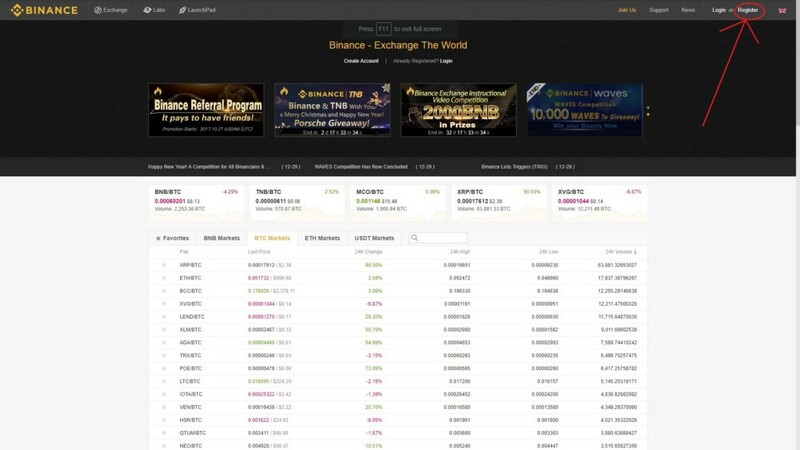 This easy guide will get you started trading on Binance.com, one of the most popular and secure exchanges to trade and invest in many different cryptocurrencies. We won’t get into the detail of how to use the entire trading platform, but we would be explaining the basics of how to buy and sell so that you will be able to start off your trading journey as a beginner. Go to Binance.com. 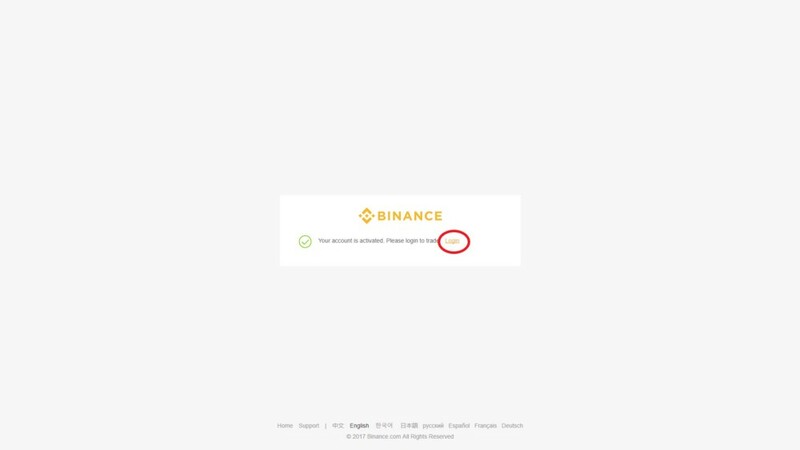 You will be taken to the Home Page of Binance. Click on “Register” on the top right to start the signing up process. Once you fill the form and register, you will be asked to complete a puzzle. Just drag the slider accordingly and complete the activity and you will be taken to the confirmation screen as shown below. 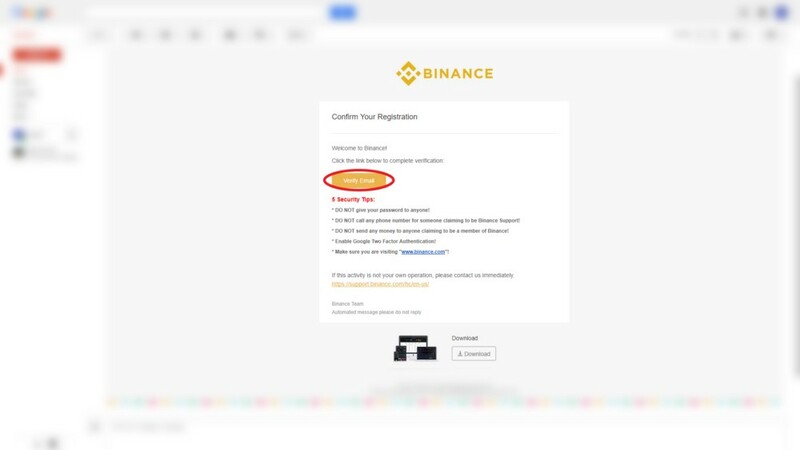 A confirmation email will be sent from Binance to your email address. Go and click “Verify Email” as shown below. 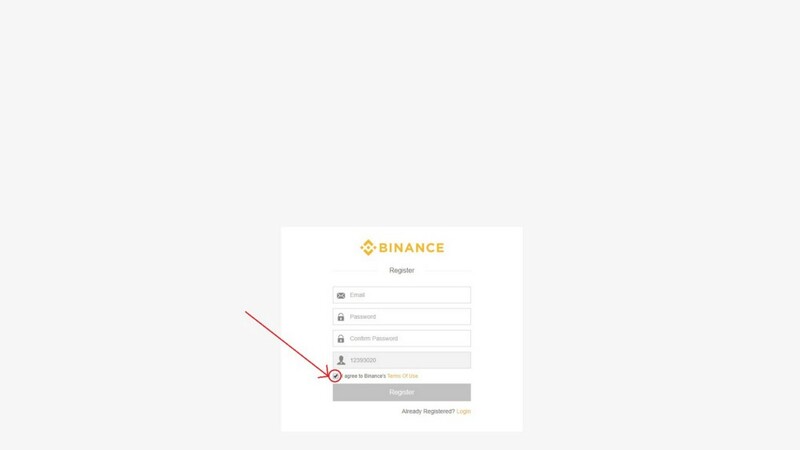 If your email is confirmed then you will be redirected to the Binance “Email Confirmed Page”. You can click on “Login” as shown below. To secure your account, click on “Google Auth” and enable your two-factor authentication through the Google “Authenticator” App. We recommend everyone to have google authentication enabled to prevent from hackers and account theft. You can also click “Skip for now” to do the 2FA process later but it is required to complete your verification process. You will be redirected to the 2FA screen after you click “Google Auth”. Download the app from the PLAY STORE (Android) or the APP STORE (iOS) depending on your device. 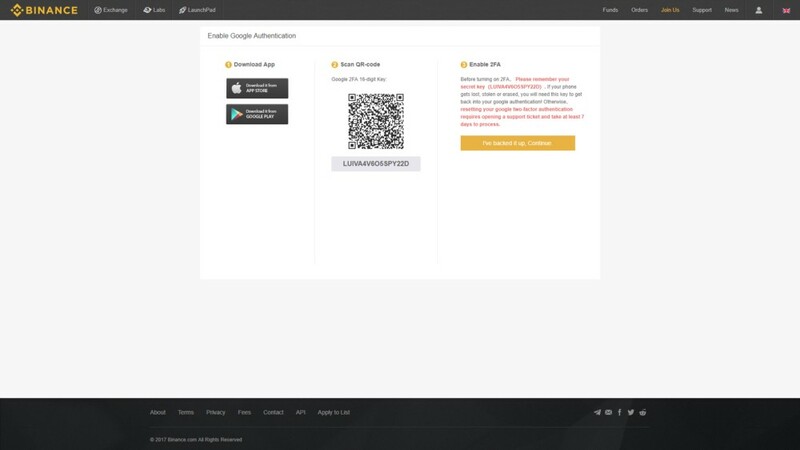 Open the “Authenticator” app that you downloaded and scan the QR code to activate Binance 2FA and use the code on your smartphone under Binance to confirm it on your Binance account. Once you confirm your 2FA, you have a 24 hour withdrawal limit of only 2 BTC. 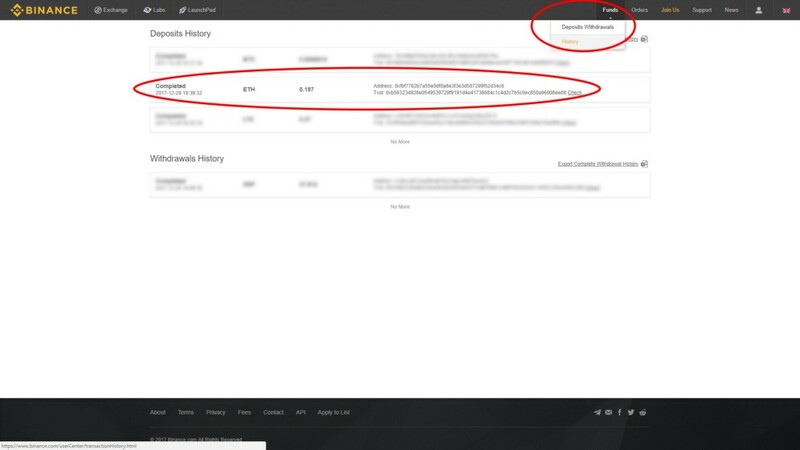 If you want to have a 24 hour withdrawal of up to 100 BTC, then you can go ahead and verify your account under your profile icon on the top right and go to “Account” by following the on screen instructions. After you get your account ready, you can transfer coins from other exchanges and apps. If you don’t have a wallet then we suggest you register on Coinbase.com and get your wallet. If you directly want to purchase or exchange Bitcoin or Ethereum into Binance with VISA/MasterCard for USD then you can use Changelly.com. Changelly allows you to exchange USD for other cryptocurrency such as BTC, ETH, LTC, GNT etc. You can also use it to exchange a cryptocurrency to another. Now, go to “Funds → Deposits/Withdrawals” as shown below. 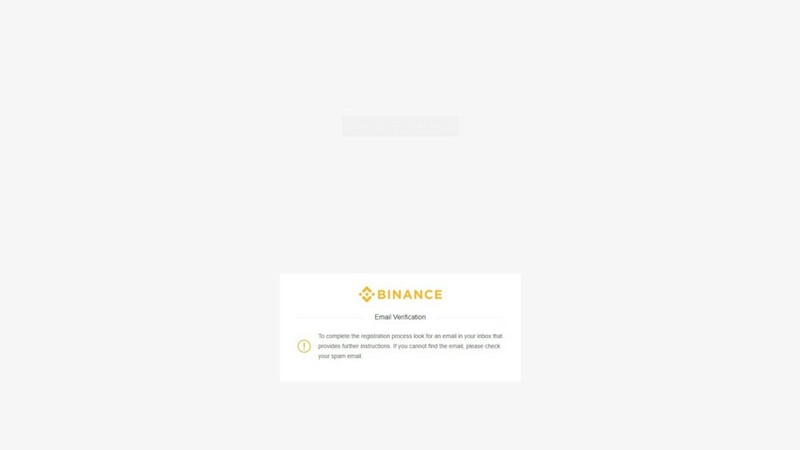 Once you get here, the following page displays all the wallets under your Binance account. 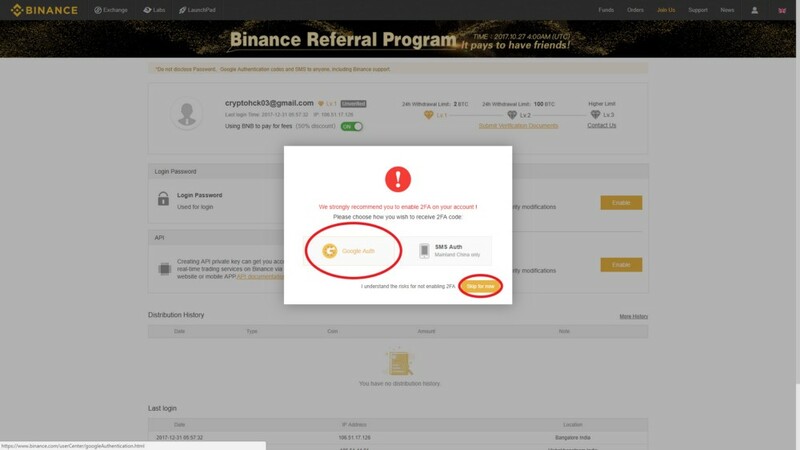 You have access to all of your wallets as soon as you create your account at Binance. You can now deposit or withdraw various cryptocurrencies. On the example below, we will show you how to deposit Ethereum. We chose Ethereum because it has less transaction fees compared to Bitcoin. 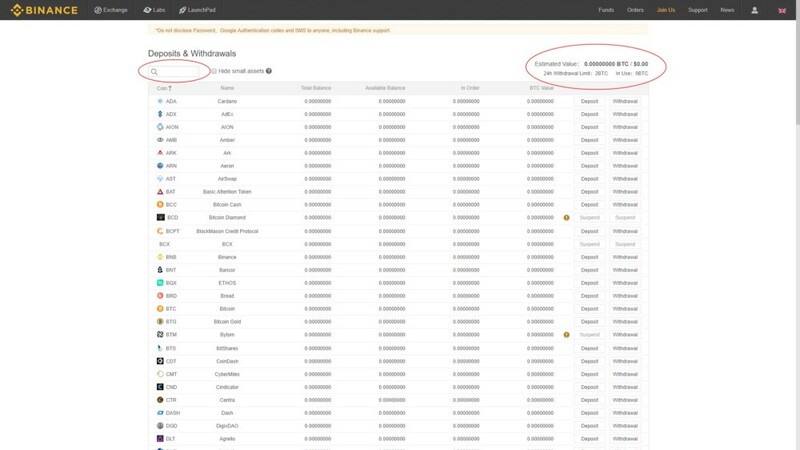 You can also choose whichever cryptocurrency you want to deposit as long as it’s in the Binance deposits/withdrawal page. 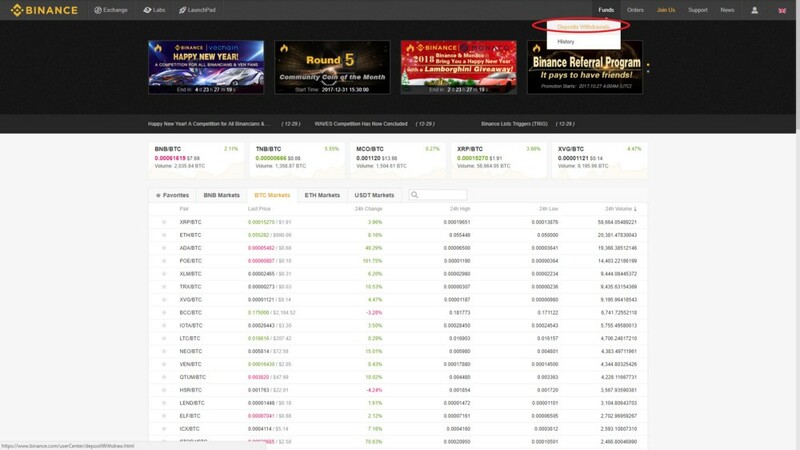 You can also use the “search box” to search the coin that you want, on the top left as marked, since Binance has many coins in it. The exchange keeps adding new cryptocurrencies every now and then for you to trade. Also as shown in the above image, you can either click the copy option near the address or use the QR code to deposit funds from your wallets such as Coinbase. The important thing to note here is the “IMPORTANT” message to the right of the currency that you’re intending to deposit or withdraw. Follow each and every point as given there for a proper transaction. If the transaction fails, you might lose your coins! As shown in the example, copy the Ethereum wallet address and use it on the app or wallet that you want to send it from. Note that you can only send Ethereum to an Ethereum wallet and vice versa. If you send any other coins other than the one intended, you will lose your coins. The total estimated value of your currency is shown in USD and Bitcoin on the top right according to the current market value. This gives you a little idea of how much you have profited, even though the market fluctuates so much. Once you’ve sent your currency from your wallet, you can go to “Funds → History” to check your deposit details. 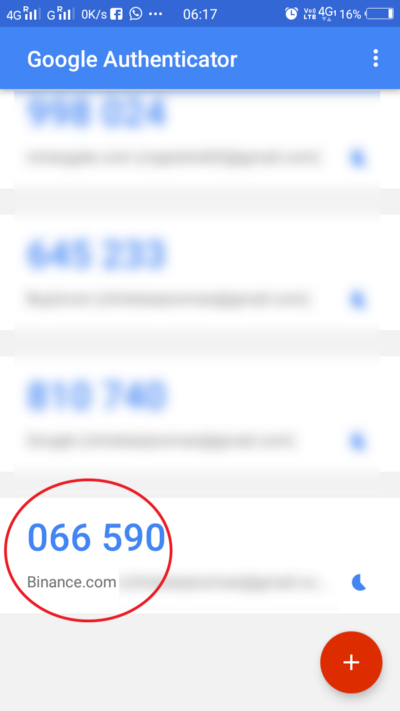 In the image below, we have marked the amount of Ethereum transferred from our other wallet and its transaction ID. It takes over 10 minutes to be completed, depending on the blockchain. Once you receive your funds, you can go ahead to Exchange → Basic or Exchange → Advanced to start trading as shown in the image below. BNB is the cryptocurrency of Binance which you can purchase and trade. Also you can use this as a trade fee. If you use BNB then the trade fee is lowered to 25%, which is highly recommended as fees many times can eat up your profits. Tether (USDT) is a cryptocurrency used by traders who are prefer trading against USD, as USDT is almost equal to the value of USD at all times. 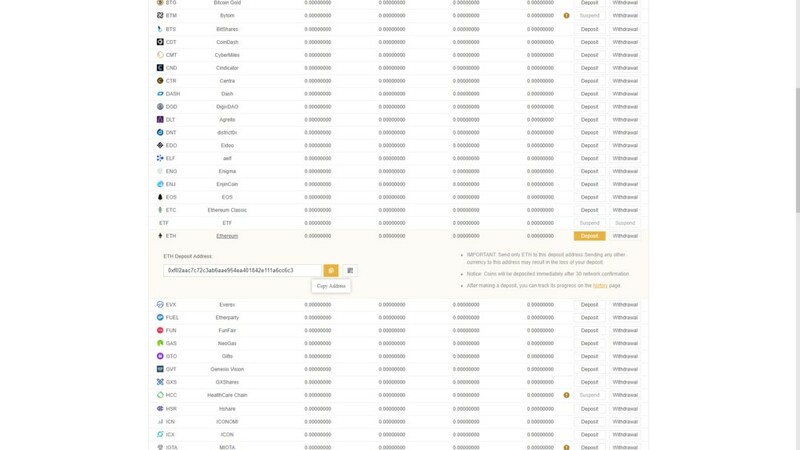 All the cryptocurrencies in Binance are traded in pairs. You can select options from the drop down menu such as XMR/BTC (buying/selling Monero for Bitcoin) or LTC/ETH (buying/selling Litecoin for Ethereum), for example. You can also set your favorites on the top drop down menu to access your frequent pairs quickly. Middle Right Ellipse: This is the current price or the last traded price of the currency that you want to trade. The USD value of that is also shown there. Tip: While having your cursor at the “Price” textbox in “Buy” or “Sell”, you can click the auctions or the current price to make that value reflect in the box to avoid typing for quick purchases. 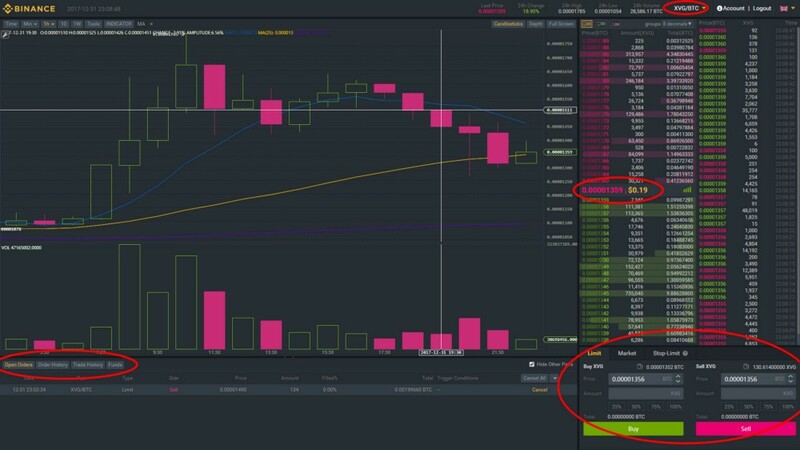 Bottom Right Ellipse: This shows the cost of the coin that you want to trade together with the volume of that coin for both buying and selling. Bottom Left Ellipse: This shows all your trades, which are open, history of orders including cancelled trades and at last your completed trade history and funds that you have. If you’re new to trading, the basic Bitcoin trading process is as follows: If you buy Bitcoins at one price and then sell them for a higher price, you make a profit of the difference between those two prices, less any commission that you paid. However, if the price goes down, you will be in the uncomfortable position of having to either sell them at a loss or hold and hope the price goes back up while risking higher and higher losses if the price continues to drop. There are two major types of traders in the Bitcoin market, they are ‘long term’ traders or investors and ‘short term’ traders or day traders. Each of these group of traders are classified by how long they may wish to hold onto a given position of trade. Whichever style of trading you go for, as long as you buy low and sell high – you profit! 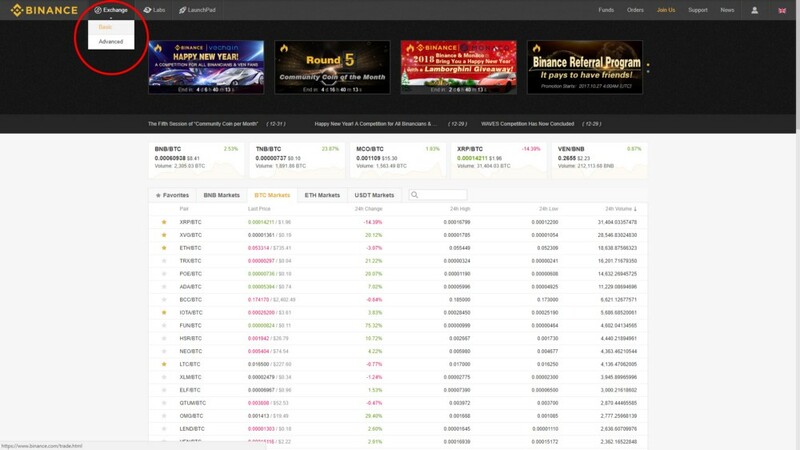 You learned how to get started trading bitcoin and other cryptocurrencies on Binance.com, now it’s up to you to invest, trade and hopefully profit! Don’t forget to research diligently before putting a significant amount of money in. Read reviews, watch YouTube videos, study the team, the white paper, etc. The more you learn, the more you earn.